Line 1 Yonge–University (formerly and sometimes still colloquially referred to as the Yonge–University–Spadina line) is a rapid transit line on the Toronto subway in Toronto, Ontario, Canada. It is operated by the Toronto Transit Commission, has 38 stations and is 38.8 km (24.1 mi) in length, making it the longest line on the subway system. It opened as the "Yonge subway" in 1954 as Canada's first underground passenger rail line, and was extended multiple times between 1963 and 2017. Averaging over 790,000 riders per weekday, Line 1 is the busiest rapid transit line in Canada, and one of the busiest lines in North America. The line forms a rough 'U' shape, with two portions running generally north–south that meet at Union in the southern part of the city's downtown, and then gradually spreading farther apart as they proceed northward. From Union station, the eastern portion of the line runs straight along Yonge Street for 16 km (9.9 mi) to its northeastern terminus at Finch Avenue, connecting with Line 2 Bloor–Danforth at Bloor–Yonge and Line 4 Sheppard at Sheppard–Yonge. The western portion snakes northwesterly from Union, initially running straight under University Avenue and Queen's Park to Bloor Street, interchanging with Line 2 at St. George and Spadina stations. It then runs for roughly 1 kilometre (0.6 mi) along Spadina Road before continuing along the Cedarvale and Nordheimer ravines to the foot of Allen Road at Eglinton Avenue. It reaches the surface and continues in the road's median for 6 km (3.7 mi), after which it dives back underground and runs on an off-street alignment below suburban industrial areas and the York University campus until Steeles Avenue, where it turns to parallel Jane Street for roughly 1.5 km (0.9 mi) until its northwestern terminus at Vaughan Metropolitan Centre, at the intersection of Jane Street and Highway 7 in the neighbouring city of Vaughan. The line's name has been changed as it has been extended. Following its opening between Union Station and Eglinton Avenue along Yonge Street in 1954, it was called "the subway" (Yonge subway is its retronym). In 1963, it was extended along University Avenue to St. George station and renamed the "Yonge–University Line". Briefly in 1966, the Yonge–University subway ran in two branches: one west along Bloor to Keele (Yonge–University–Bloor), the other east along Bloor and Danforth to Woodbine (Yonge–University–Danforth) via Bay Lower station. In 1978, the "Spadina" section was opened and the line became the "Yonge–University–Spadina Line" (YUS). Although only two stations are on Spadina Road, a larger portion of the line was originally intended to follow the planned Spadina Expressway, which was partially built as Allen Road. The subway also had an additional internal route number: route 602. Unofficially, subway lines were already numbered, but in October 2013, the TTC announced plans to display line numbers publicly to help riders to navigate the system. 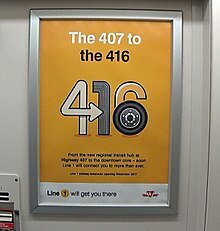 In March 2014, the line was officially numbered and renamed "Line 1 Yonge–University", with the Spadina part being dropped from the name. Announcements, documentation and rapid transit maps across the system now refer to the line as "Line 1" or "Line 1 Yonge–University". There were several early proposals to build a subway along or near Yonge Street, many of which involved running streetcars in a tunnel. Here are some of the proposals. In 1909, an English company offered to build and operate a subway along Yonge Street from Eglinton Avenue to Front Street. The plan was abandoned because the city would take over public transit in 1921, and the company's franchise would then terminate. In 1910, when running for mayor of Toronto, Horatio C. Hocken proposed building a "tube" along Yonge Street from north of St. Clair Avenue to Front Street. He dropped the idea after losing that election. In 1911, the city engineer planned a line from Bay and Front Streets to Yonge Street and St. Clair Avenue. The electorate rejected the plan. In 1931, City Controller Hacker proposed a north–south subway running from Avenue Road and St. Clair Avenue south to Front and York streets, making a wide loop via Front, Scott, Victoria and Gerrard streets. The TTC rejected this proposal saying there was insufficient population to justify such a project. In 1942, the TTC proposed a north–south line under Bay Street from Union Station to Bloor Street then jogging over to Yonge Street to continue to north of St. Clair Avenue. This idea was rejected in favour of a subway completely along Yonge Street. 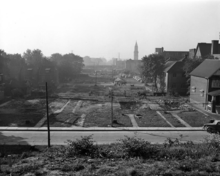 Homes were demolished east of Yonge Street near Summerhill in order to construct a cut-and-cover tunnel. During World War II, workers travelling from their homes in "northern Toronto" (which would now be considered the downtown core) to the industrial areas to the east and west of the downtown area on Yonge seriously strained the existing road and streetcar networks. There was concern that the expected post-war boom in car ownership would choke the city with traffic. The scheme was first proposed by Toronto Transportation Commission in 1942 to relieve congestion, which was delaying their bus and tram services. The TTC formed a Rapid Transit Department and studied various solutions between 1942 and 1945. A plan was put to the voters on January 1, 1946. The plan had two parts. First, it featured a "rapid transit subway" operated with subway trains from Eglinton Avenue as far as College Street. The line would continue directly under Yonge and Front Streets to Union Station. Second would be a "surface car subway", diverting streetcar services off Queen and Dundas Street. This would run mostly along Queen Street, with each end angling north to reach Dundas Street west of Trinity Park and Gerrard Street at Pape Avenue. The route would run directly under Queen Street from University Avenue to Church Street, with the rest off-street. The vote was overwhelmingly in favour, and Toronto City Council approved construction four months later. The plebiscite contained the condition that the federal government would subsidize 20% of the project. The federal Minister of Reconstruction, C.D. Howe, promised federal support in an October 3, 1945 letter. However, the funding fell through over a disagreement about the details of the employment arrangements. A scaled down proposal, about 20% smaller, was agreed to in its place. The work along Queen Street was abandoned temporarily, and the original $42.3 million ($613 million in 2018) was reduced to $28.9 million ($419 million in 2018) plus $3.5 million ($50.8 million in 2018) for rolling stock. After a two-year delay due to postwar labour shortages, construction on the new subway did not start until September 8, 1949. A total of 1.3 million cubic metres (1.7 million cubic yards) of material was removed and some 12,700 tonnes (14,000 tons) of reinforcing steel and 1.4 million bags of cement were put into place. A roughed-in station was constructed below Queen station for a proposed Queen line, but that line was never built. The TTC intended the subway to use streetcar-derived trains, like this former Chicago 'L' train preserved at the Halton County Radial Railway. The Gloucester (G-series) trains were chosen to be the system's first rolling stock. Service on the Yonge route would be handled by new rolling stock, and the TTC was particularly interested in the Chicago series 6000 cars, which used trucks, wheels, motors, and drive control technologies that had been developed and perfected on PCC streetcars. However, the United States was in the midst of the Korean War at the time, which had caused a substantial increase in metal prices, thus making the PCC cars too expensive. Instead, in November 1951, an order was placed with the Gloucester Railway Carriage and Wagon Company in England for 104 cars for $7,800,000 ($75.4 million in 2018) including spare parts. The Toronto Subway typeface and TTC logo were also designed during this period. The logo used during the subway's development was designed by mid-century architect John C. Parkin and chief architect Arthur Keith. Against the wishes of Walter Paterson, the chief engineer, TTC chairman William McBrien and general manager H.C. Patten rejected the design in favour of one that was more similar to the one previously used on TTC vehicles. 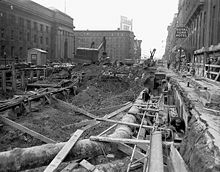 After five years of construction, Ontario Premier Leslie Frost and Toronto Mayor Allan A. Lamport officially opened the 7.4-kilometre (4.6 mi) long Yonge subway on March 30, 1954. It was the first subway in Canada. The original Yonge Street subway line went from Union subway station near the namesake railway station north to Eglinton station. Dignitaries, including the premier and the mayor, rode the first train that morning, going north from the yards at Davisville station, and then from Eglinton south along the entire line. The line was then opened to the public, and that day at 2:30 pm, the last streetcar made its final trip along the Yonge streetcar line. Trains operated at average speeds of 32 kilometres per hour (20 mph). The plan to operate two-car trains during off-peak hours was abandoned in favour of four-car trains, and six-car trains were standard during most periods, with some eight-car trains used during peak periods. On February 28, 1963, an extension was added to curve north from Union Station, below University Avenue and Queen's Park to near Bloor Street, where it turned west to terminate at St. George and Bloor Street. On June 23, 1969, the University subway service from St. George to Union stations was discontinued entirely after 9:45 p.m. from Mondays to Saturdays and all day on Sundays and holidays. The 5B Avenue Road buses runs in place between Eglinton and Front Street whenever the University Subway did not operate, with side-jaunts to St. George station to capture passengers from the Bloor Subway. This arrangement remained in place until January 28, 1978, when the Spadina Subway opened north to Wilson Station. On March 31, 1973, the line was extended north from Eglinton to York Mills, and on March 29, 1974 to Finch. These two extensions were part of the North Yonge Extension project, bringing the subway to North York. Stations were also planned for Glencairn (between Eglinton and Lawrence, though another Glencairn station would be built later on the Spadina section), Glen Echo (between Lawrence and York Mills) and Empress (between Sheppard and Finch, later opened as North York Centre station). On January 27, 1978, the Spadina segment of the line was opened, going from St. George station, the north terminus of the University line, to Wilson station. From St. George station, the 9.9 km (6.2 mi) segment ran north and northwest to Eglinton Avenue and William R. Allen Road, then north along the median of the Allen Road to Wilson Avenue. This extension had been proposed as part of the Spadina Expressway, but when the expressway portion south of Eglinton Avenue was cancelled after massive protests, the subway was still built following the route through Cedarvale Ravine. Hence, it is called the Spadina subway line, though it follows Spadina Road for less than 2 km (1.2 mi). On June 18, 1987, North York Centre Station was added between Sheppard and Finch stations. 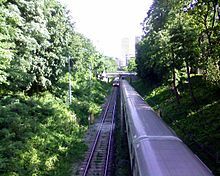 On August 11, 1995 at 6:02 pm, the Russell Hill subway accident occurred as a southbound subway train heading toward Dupont station crashed under Russell Hill Drive, killing three passengers and sending 30 to hospital. This accident prompted the Toronto Transit Commission to review its practices and put resources into safety. As of November 17, 2016, with the Presto fare gates installed at Eglinton station, all of the stations along this line are Presto-enabled. 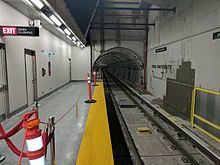 The Toronto–York Spadina Subway Extension (TYSSE) is an extension of the western portion of Line 1 from Sheppard West station northwest via York University to the Vaughan Metropolitan Centre at Jane Street and Highway 7 in the city of Vaughan. Six new stations were built along the 8.6 km (5.3 mi) route, with 6.2 km (3.9 mi) in the City of Toronto and 2.4 km (1.5 mi) in York Region. Service on the extension began on December 17, 2017. It was the first new section of a subway line to be opened since the opening of Line 4 Sheppard in 2002. Approximately 2,900 new parking spaces were built at three stations along the extension, in order to encourage commuters to use the subway system. Finch West station has 400 spaces, Pioneer Village station has 1,900 spaces, Highway 407 station has 600 spaces, and Vaughan Metropolitan Centre station has 900 spaces. Beyond the last station, tail tracks extend to Portage Parkway for train storage. A Spadina extension into Vaughan had been suggested as early as 1988, when Lorna Jackson campaigned during the Vaughan municipal elections to extend the subway system to the proposed Highway 407 corridor. Greg Sorbara, former deputy premier of Ontario and finance minister, was a key promoter of the TYSSE to the York University and into York Region, in which his riding was based. In his memoirs, he said that "it would not only be great for the people in the region, but also for my political prospects." In 2015, Sorbara indicated that, while David Miller was mayor of Toronto, the then-mayor was initially not enthusiastic about the extension. Sorbara said, "He should have been thrilled at the prospect of the province providing $670 million for more subway infrastructure, regardless of where it went." In 2003, a temporary busway was planned between Downsview (renamed Sheppard West in mid-2017) station and the campus, but was opposed by the university, which felt it would lessen government willingness to extend the subway. After numerous delays, construction on the York University Busway started on July 25, 2008, with a short section of the busway opened on September 6, 2009 and the remainder opened on November 20, 2009. The estimated cost was $2.09 billion in 2006, which have been escalated to $2.63 billion considering costs at the year of occurrence. The Province of Ontario deposited $870 million into the Move Ontario Trust. The federal government committed $697 million, but only released $75 million at the start of its fall 2006 election campaign. The City of Toronto and the Regional Municipality of York committed to fund one-third of total project costs, with Toronto contributing $526 million and York Region contributing $352 million. The first construction contract was awarded on February 27, 2008. Construction commenced in July 2008 with the relocation of sewers. The TTC purchased two tunnel boring machines in late 2010 from LOVAT Inc. (since acquired by Caterpillar Inc.) for $58.4 million to dig tunnels on this extension, and two more boring machines were delivered in early 2011. Tunnel boring for the extension began on June 17, 2011 and was completed on November 8, 2013. By 2015, the project had encountered several problems, such as frequently changing station design plans, project management problems resulting in the dismissal of two TTC managers, poor performance by some contractors, death of a worker at the York University station site and harsh winter weather. After the extension was found to be over-budget in March 2015, the Toronto City Council approved an additional $150 million in funding, with $90 million from Toronto and $60 million from York Region. The TTC subsequently signed a contract with Bechtel, worth up to $80 million, to assume management of the extension. This bypassed the tendering process usually used to hire contractors. During construction, costs grew from the original $2.6 billion to about $3.2 billion by January 2016. The extension north of Steeles Avenue has been criticized in the press for several reasons. The TTC had intended to extend the subway as far as York University, with a vast bus terminal complex at the future Pioneer Village station. However, provincial funding required the line crossing the city limits. The area around Vaughan Metropolitan Centre station is occupied by big-box stores and highways, and lacks the dense development that surrounds most other subway stations. In addition, Highway 407 station was built within vacant land, across the street from Beechwood Cemetery. During the proposal stage of the project, the TTC had concluded there were insufficient projected population densities to justify the line north of Steeles Avenue. Some of the new stations are projected to be among those with the lowest ridership in the subway system. Vaughan plans to use the subway extension to spur the development of a transit-oriented city centre at Vaughan Metropolitan Centre station. Vaughan Councillor Alan Shefman stated the new city centre will eventually create the density to justify a subway. To this end, Vaughan Mayor Maurizio Bevilacqua worked with a developer to build several high-rise buildings near Vaughan Metropolitan Centre station; however, as of December 2017, the area still mainly consists of big box stores, low rise commercial buildings and parking lots. As a precedent, the Sheppard subway shows that while a subway may spur development, that development may not result into a high subway ridership. As Royson James stated in the Toronto Star, commuter destinations may be scattered throughout the Greater Toronto Area where public transit is inconvenient to use. Outgoing TTC CEO Andy Byford said: "People say '[build] there and they will come.' I think the most pressing need is to now focus on subway expansion where it's not so much that they will come, it's [that] there's already a demonstrable need." However, Globe and Mail columnists Oliver Moore and Jeff Gray wrote in the context of the TYSSE: "But that advice will have to compete with the growing power of the suburbs, and the eagerness of Queen's Park to court them." Toronto city councilor and TTC commissioner Glenn de Baeremaeker said: "Whether [the subway], quote, merits on a technical sense, the ridership or not, it's a philosophical decision the city has made and society has made. People like subways." According to a TTC forecast reported by transit advocate Steve Munro in early 2015, the TTC's annual operating costs for the entire TYSSE will be $33.7 million, or $14.2 million net of revenue. This would produce a 58% cost recovery compared to 70% for the TTC system as a whole. These costs, including those for the portion in Vaughan, will be covered by the TTC and the City of Toronto. In 2016, the expected net cost to run the extension was revised to $30 million. The TTC will be responsible for the full operating costs of the Spadina Subway extension from Downsview (renamed Sheppard West in mid-2017) to the Vaughan Corporate Centre (renamed Vaughan Metropolitan Centre) and receive all revenue from the Project (passenger revenue, commuter parking, advertising, retail leasing), with the exception of the operating costs and revenues for bus terminals and passenger pickup and drop off facilities located within York Region, which shall be maintained and operated by York Region. As part of the TTC's modernization efforts and the rollout of the Presto card, the TTC has begun phasing out toll collector booths at subway stations. As of January 6, 2019[update], Line 1 stations between Lawrence West and Vaughan Metropolitan Centre no longer have staffed fare collector booths. Instead, they have roaming customer service agents (CSAs). While TTC passengers can still pay their fares at these stations with legacy TTC fare media – such as tickets or tokens – they will not be able purchase these types of fares there. As with the TTC's surface vehicles, exact change is required when paying cash. As with all TTC subway stations, Presto cards are accepted and new Presto fare vending machines have been installed that enable passengers to buy Presto cards and load funds or a digital monthly TTC pass onto the electronic fare cards. Eventually, all TTC subway station toll booths will be permanently closed and replaced by CSAs. Early statistics published by the CBC report ridership numbers for 3 of 6 new stations on the TYSSE. In total, "57,100 riders boarded trains at the new stations during a week of service in May ." Finch West station pulled the most riders for the month, with approximately 17,000 customers using the station daily (for comparison, Lawrence West and Lansdowne have similar usage). It is worth noting that these numbers were recorded during York University's strike, leading to fewer passengers at Pioneer Village and York University. Downsview Park and Highway 407 saw some of the worst ridership numbers in the entire subway system, with 2,000 daily customers at Downsview Park and 2,900 at Highway 407. Downsview Park now replaces Bessarion as the least used subway station on the TTC. Statistics in late 2018 showed that ridership at Downsview Park increased to 2,500 customers per day and Highway 407 increased to 3,400. The busiest station on the extension is now York University, which has about 34,100 daily customers. Finch West and Pioneer Village both serve approximately 17,000 customers and the terminus, Vaughan Metropolitan Centre, has a daily usage of 14,800. However, the average daily usage of all TTC subway stations is a little more than 34,000, which means that aside from York University station, all stations belonging to the extension are still seeing well below average usage. The line is mostly underground, but has several surface or elevated sections between Sheppard West and Eglinton West, and between Bloor and Eglinton; some portions of the section between Bloor and Eglinton were originally open and have since been covered over to permit other uses above the tracks. Sections between Bloor–Yonge and the track south of Summerhill, and between St. Clair and Eglinton remain in their original open state. Between Summerhill and St. Clair, the track was built in open cut, but has since been covered over. Evidence of this can be seen in the tunnel: there are no columns or walls between tracks, and ballast and drainage ditches are present, something not seen in the rest of the subway system. There are also tree stumps and the stubs of lamp posts in the tunnel. There are also clues outdoors: seemingly unnecessary railings along the sides of a nearby street, which was once on an exposed bridge, and empty lots following the trains' right-of-way marked with signs warning heavy vehicles and equipment to keep off because they might fall through to the columnless tunnel below. Most of the tunnel was constructed by a cut-and-cover method, but some was bored, as noted below. All stations, whether by transfer or fare-paid terminal, connect to surface TTC bus and/or streetcar routes. Other surface and train connections are noted below. As of December 17, 2017[update], with the opening of the TYSSE, 26 stations have elevators for wheelchair and stroller access. The preferred alignment and placement for four stations for the extension beyond Sheppard West Station to serve York University were finalized in September 2005. Eglinton station's Vitrolite-tiled walls are the last such station wall treatment left in the system. The original design of the oldest stations in the subway system, which are on the Yonge line (from Union to Eglinton), are mainly utilitarian and characterized by vitreous marble wall tiles and the use of the Toronto Subway font for station names. Eglinton Station is the only station to retain this wall treatment, though Queen Station retains a narrow band of original blue Vitrolite tiles near the ceiling at platform level. The design of the stations on the University line was mainly utilitarian and this style (sometimes referred to as "bathroom modern") was later used for Line 2 Bloor–Danforth as well. Queen's Park and St. Patrick stations have circular and semi-circular cross-sections, because they are constructed in bored tunnels. Museum station was renovated to have columns resemble artifacts found in the nearby Royal Ontario Museum. Lawrence, Sheppard–Yonge, and Finch stations are similar to each other in design, but have different colour schemes: Lawrence is red and cream, Sheppard is yellow and dark blue, and Finch is light grey, medium grey, and dark grey. York Mills station formerly followed the same design scheme—in light green and dark green—until it was renovated. The segment of the line from St. George to Wilson station (formerly the Spadina segment) has art and architecture that is unique for each station. The art installed at Glencairn and Yorkdale stations has been removed, as the former's art had faded in sunlight and the latter was too costly to operate. Since late 2017, work is underway to restore the art in both stations. North York Centre station is an infill station. Its design is different from the other stations in the earlier North Yonge extension. Sheppard West station, which was opened in 1996, has art and architecture that is different from the earlier Spadina line stations. Stations along the University line extension north from Sheppard West to Vaughan Metropolitan Centre, in keeping with the pattern of the rest of the former Spadina line, also feature public art and architecture from notable creators. However, the platform walls have no tiles or other cladding and are simply bare concrete, though structural elements on the platforms themselves are clad. On the Yonge portion of the line, nearly all stations located at cross streets are named after said streets, while on the University portion, they are either named for local landmarks with the cross street subtitled below (e.g. Osgoode – Queen Street) or after cross streets but with a "West" suffix for stations at streets that have counterparts along Yonge. The pattern of using landmarks as station names was exclusively used on the original (southern) section of the University branch, and the West designated street-naming convention is typically used on the former Spadina (northern) section. The two interchange stations on the University branch where it intersects Line 2 Bloor–Danforth are named St. George and Spadina after the north–south cross streets of Line 2, which runs below Line 1 between these stations. Due to various factors, some stations along the Spadina portion are named, formerly were named, or are proposed to be renamed using landmark or district names, albeit without subtitles: the stations at Steeles Avenue and Highway 7 (which have no corresponding stations along the Yonge branch) are respectively named "Pioneer Village" (after the nearby Black Creek Pioneer Village) and "Vaughan Metropolitan Centre" (after Vaughan's new downtown core, based on the precedent set by North York Centre and Scarborough Centre stations). Sheppard West was originally called "Downsview" but was renamed in 2017 to avoid confusion with the adjacent new Downsview Park station, and Eglinton West will be renamed "Cedarvale" when it becomes an interchange station with the opening of Line 5 Eglinton in 2021. Southbound station platform signage on both branches indicates Union as a terminal station due to it being located at the southernmost point of the line's rough 'U' shape, where it turns northward when travelling along either branch. The train destination signs display the northwestern terminal station as "Vaughan" rather than its full name, Vaughan Metropolitan Centre, for brevity. Until the 1990s, train destination signs read "VIA DOWNTOWN" after the terminal station name. As with other TTC subway lines, Line 1 operates most of the day, and is generally closed between 2:00 a.m. and 6:00 a.m. EST on weekdays and Saturdays, and 2 a.m. to 8 a.m. on Sunday. Trains arrive at stations 2–3 minutes during peak periods and 4–5 minutes during off-peak periods. During the morning peak, from 6:00 am to 9:00 am Monday to Friday, half the trains are turned back at Glencairn station resulting in limited service north of that point. The turnback was moved from St. Clair West station to Glencairn in 2016, and current plans call it to be moved further to Pioneer Village station in late 2017 when the Line 1 extension opens, though this part of the plan is not implemented yet. Overnight service on the Yonge segment of the line is provided by 320 Yonge Blue Night from Queens Quay to Steeles with headways of 3 to 15 minutes. The University segment does not have an overnight service. The line is solely operated with the TTC's newer Toronto Rocket (TR) subway trains, which are based on Bombardier's Movia family of trains. Unlike other trains in the Toronto subway rolling stock, the TR trains have a "six-car fixed" articulated configuration with full-open gangways, allowing passengers to walk freely from one end to the other. The TR trains were scheduled for delivery starting between late 2009 and early 2010, but was delayed until late 2010 due to production problems. They entered revenue service on this line on July 21, 2011, replacing the older H5 and the T1 series trains, which had been used on this line. (The T1 series trains, which used to operate on this line, were transferred over to Line 2 Bloor–Danforth where they replaced the older H4 and H6 series trains). 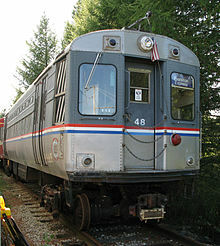 From the line's opening in 1954 until 1990, it was operated with G-series cars, and was also served with a mix of M1 and H1/H2/H4 subway cars between 1965 and 1999. In October 2018, the TTC restarted the practice of using gap trains to relieve crowding at Bloor–Yonge and St. George stations, where respectively 225,000 and 135,000 passengers transfer trains daily. The TTC observes that one empty gap train can clear a crowded platform at Bloor–Yonge. The TTC used to run gap trains prior to late 2017 before discontinuing the practice because of a "change in operating philosophy". The practice was reinstated in response to a potentially dangerous, overcrowding incident that occurred at Bloor–Yonge in January 2018. In October 2018, the TTC used three gap trains, which sit on pocket tracks near Davisville, Eglinton and York Mills stations and move into southbound service when station over-crowding is detected. For November 2018, the TTC plans to run a fourth gap train in the morning peak period plus another during the afternoon peak. Gap trains can also increase the capacity of Line 1, which often runs above its scheduled capacity of 28,000 passengers per hour. To address that demand, the TTC normally runs an average of 25.5 trains per hour through Bloor–Yonge and St. George stations in the morning peak period. With three gap trains, it can run up to 28 trains per hour. The TTC is converting its block signal system to automatic train control (ATC) on Line 1 Yonge–University at a cost of $562.3 million. With ATC, the TTC will be able to reduce the headway between trains on Line 1 from 2 minutes and 30 seconds to 1 minute and 55 seconds during rush hours, and allow a 25 percent increase in the number of trains operating on Line 1. ATC will be introduced to Line 1 in phases. It was first introduced with the opening of the TYSSE on December 17, 2017, between Vaughan Metro Centre and Sheppard West. On November 4, 2017, the TTC successfully completed a 13-day test of ATC with trains using it in regular service between Dupont and Yorkdale stations. At the conclusion of the test, the feature was turned off between these two stations to allow installation of ATC through the interchange special work at the Wilson Yard. ATC was permanently extended south to Dupont station on December 3, 2018. The entire line is scheduled to be fully converted to ATC in 2019. The Yonge North Subway Extension is a proposal to extend the Yonge Street portion of Line 1 north of Finch Station to Richmond Hill in York Region. Five new stops would be added at Cummer/Drewry, Steeles, Clark, Langstaff/Longbridge and the Richmond Hill Centre Terminal of Viva bus rapid transit. The proposed extension would cost $5.6 billion, as of May 2017. It would take 10 years to build and would replace many of the 2,500 buses per day that run along the route. Ridership on the proposed extension is estimated at 165,000 per day. The extension would be 7.4 km (4.6 mi) long. York Region estimates that the extension will help to create 31,000 jobs, and that the extension would carry 58 million riders annually by 2031. On June 15, 2007, the Ontario government announced plans to fund this extension as part of a network of rapid transit growth called MoveOntario 2020. In April 2009, the Environmental Assessment for the Yonge North Subway Extension was approved. In November 2014, an addendum to the Environmental Assessment was approved to include an underground train storage facility and surface facilities. By 2016, the province had committed to fund 15 per cent of the preliminary engineering and design for the project. On June 2, 2016, the provincial government gave $55 million to Metrolinx in order to work with the TTC and the York Region on a detailed plan for the subway extension. In May 2017, Toronto Mayor John Tory announced he would not support planning for the Yonge North Subway Extension unless there is a funding commitment for the Relief Line to relieve crowding on Line 1, expected to be at capacity by 2031. If so authorized, city staff could complete 15–30 per cent of the design for both projects, including schedules and better estimates, by the end of 2019. As of May 2017, planning was more advanced for the Yonge extension than for the Relief Line. Toronto council approved the plan in principle in January 2009 provided there were upgrades to the existing line to support the additional ridership from York Region. Specifically, Toronto politicians say that the Yonge line does not have the capacity to support an extension to Richmond Hill until a separate relief line is built between Pape and Osgoode stations. In the morning rush hours, southbound trains on the Yonge line usually reach capacity between York Mills and Eglinton stations. In March 2016, the mayor's office said that SmartTrack and automatic train control may also be required. In March 2016, York Region officials said that SmartTrack, electrified GO service, the Spadina subway extension and automatic train control will be implemented within a decade, and that these would be sufficient to support the extra ridership of an extension to Richmond Hill. Thus, the deputy mayor of Richmond Hill wanted to start construction of the extension by 2019. Vaughan politicians and officials are basing their case on a Metrolinx report from June 2015. The report indicates the Yonge line would have a capacity of 36,000 passengers per hour per direction (pphpd) in 2021 with automatic train control. Demand is 31,200 pphpd in 2015 plus 6,600 growth by 2031 plus 2,400 for the extension north of Steeles giving a total demand of 40,200 pphpd. The TYSSE would divert 1,300 pphpd and Regional Express Rail would divert another 4,200 leaving a demand of 34,700 pphpd and 1,300 pphpd in excess capacity. (However, as of April 2016, Metrolinx has no immediate plans to provide electrified GO service on the Richmond Hill line.) Transit advocate Steve Munro says that, given the Metrolinx analysis, the line would be at 96% capacity in the peak hour and, because this is the peak hour average, there would be some overcrowding due to variations over the hour. In January 2019, Metrolinx reported that the Relief Line must be completed before opening the Yonge North Extension, thus reversing its opinion in its June 2015 report. The 2019 report also predicted that if both phase 1 of the Relief Line (between Pape station and downtown) and the Yonge North Extension were built, Line 1 would be over capacity by 2041. At that point, phase 2 of the Relief Line (north to Sheppard Avenue) would be required. GO Transit's long-term plan also calls for all-day service on its Richmond Hill line that would run express trains every 15 minutes between its Langstaff Station adjacent to the Richmond Hill Centre terminal, and Union Station in downtown Toronto, calling into question the additional need for a subway extension. As of April 2016, Metrolinx had no plans to electrify the Richmond Hill line, which would require $1 billion for flood mitigation. Planned service improvements are every 15–30 minutes but only in the peak period. Given the wait for the Richmond Hill extension, there were plans to have Viva Bus Rapid Transit bus lanes along Yonge Street from Finch Avenue to Highway 7. However, by April 2014, the plans were revised to run the busway from Highway 7 (at the proposed terminal of the North Yonge Subway Extension) north to Newmarket with some portions of the route operating in mixed traffic through Richmond Hill. The expected completion date of the revised busway is 2020. A local group in York Region was lobbying for the cancellation of the planned busway along this route, which would have been a part of York Region's Viva bus rapid transit. The group was concerned about a loss of treed boulevards and private property when widening Yonge Street for bus lanes through Thornhill south of Highway 7. ^ Does not include the section between Dupont and Vaughan Metropolitan Centre stations, which uses Alstom SA Urbalis 400 CBTC that is being rolled out to the rest of Line 1. See Signalling of the Toronto subway § CBTC for further information. ^ a b c d "Toronto Transit Commission Subway ridership, 2018" (PDF). Toronto Transit Commission. Retrieved February 5, 2019. ^ a b "2011 TTC Operating Statistics". Toronto Transit Commission. Retrieved February 10, 2013. ^ Giambrone, Adam (June 1, 2010). "Rocket Talk: What's the Status of the Downtown Relief Line?". Torontoist. Retrieved February 7, 2018. ^ "TTC considers numbering subway lines – CityNews Toronto". CityNews Toronto. October 23, 2013. ^ "TTC Subway/RT". Toronto Transit Commission. Retrieved February 17, 2012. ^ a b c d e f Mike Filey (1996). The TTC story: the first seventy-five years. Dundurn Press. pp. 67–71, 87–89. ISBN 155002244X. Retrieved February 1, 2017. ^ Cooke, B.W.C., ed. (June 1954). "Yonge Street Subway, Toronto". The Railway Magazine. Vol. 100 no. 638. Westminster: Tothill Press. pp. 420–425. ^ Bateman, Chris (April 13, 2018). "TTC's subway station typeface a font of intrigue". The Globe and Mail. ^ "Significant dates in Canadian railway history". Colin Churcher's Railway Pages. March 17, 2006. Archived from the original on April 24, 2006. Retrieved March 29, 2006. ^ Toronto Transit Commission. "History". Retrieved February 1, 2017. ^ a b c d e f "2013 TTC Operating Statistics". Toronto Transit Commission. Retrieved January 27, 2017. ^ "Yonge Subway Extension to York Mills". The Globe and Mail. 130 (38, 470). Toronto. March 27, 1973. p. 13. ^ Hall, Joseph (August 6, 2005). "Ten Years After". Toronto Star. Retrieved February 17, 2012. ^ PRESTO card [@PRESTOcard] (November 17, 2016). "Eglinton subway station has brand new PRESTO fare gates! All of @TTChelps Line 1 is now PRESTO enabled. #spotPRESTO" (Tweet) – via Twitter. ^ a b "TTC Spadina subway extension website". .ttc.ca. Retrieved February 13, 2014. ^ a b c "Toronto-York Spadina subway extension $400M over budget". Canadian Broadcasting Corporation. January 15, 2016. Retrieved June 4, 2016. ^ "Toronto Transit Commission Board Meeting – September 5, 2017". Retrieved September 5, 2017. ^ "TTC Toronto-York Spadina Subway Extension Frequently Asked Questions". .ttc.ca. Archived from the original on March 2, 2012. Retrieved February 17, 2012. ^ "subwayparking.com". SmartCentres REIT. December 17, 2017. Retrieved January 17, 2018. ^ "The VMC Plan: Secondary Plan for the Vaughan Metropolitan Centre" (PDF). City of Vaughan/Urban Strategies Inc. January 7, 2013. p. 26. Retrieved March 11, 2016. ^ "Vaughan". Toronto Star. November 8, 1988. ^ a b James, Royson (May 4, 2015). "Ours is to question why, and why again: James". Toronto Star. Retrieved June 4, 2016. ^ Mackenzie, Robert (July 25, 2008). "Ground-breaking for York University busway project today". transit.toronto.on.ca. Retrieved February 17, 2012. ^ Mackenzie, Robert (September 5, 2009). "TTC revises routes and services, September 6: 196 York University Rocket". transit.toronto.on.ca. Retrieved February 17, 2012. ^ Mackenzie, Robert (November 14, 2009). "York University busway opens, November 20". transit.toronto.on.ca. Retrieved February 17, 2012. ^ TTC (March 26, 2008). "Toronto-York Spadina Subway Extension Project Delivery Strategy Process". Retrieved March 6, 2015. ^ "Spadina Subway Extension February 2008 Update". TTC. Retrieved March 31, 2008. ^ "Work begins on subway extension into York". CTV. July 9, 2008. Retrieved July 11, 2008. ^ Mackenzie, Robert (August 8, 2009). "Extending the Spadina subway: Boring news". Transit Toronto. Retrieved August 8, 2009. ^ "Major transit delay – Rapid transit project pushed back to 2020". Yorkregion.com. May 20, 2010. Retrieved February 17, 2012. ^ "TTC Project News December 2013"
^ Powell, Betsy (March 31, 2015). "Council OKs $150-million deal to fix Spadina subway extension plan". Toronto Star. Retrieved May 9, 2015. ^ Hui, Ann (April 13, 2015). "TTC hires firm to manage troubled Spadina subway extension". The Globe and Mail. Retrieved May 9, 2015. ^ Benzie, Robert; Tess Kalinowski (July 25, 2008). "New subway in sight at last". Toronto Star. Retrieved July 25, 2008. ^ a b Noor Javed (April 6, 2012). "Toronto's subway brings downtown vision to Vaughan". Toronto Star. Retrieved June 30, 2016. ^ "Beechwood Cemetery". Google Maps. June 30, 2016. Retrieved June 30, 2016. ^ a b c Oliver Moore & Jeff Gray (December 14, 2017). "Next stop, Vaughan: Inside the Toronto subway's big move beyond the city limits". The Globe and Mail. Retrieved December 15, 2017. ^ a b Tess Kalinowski (March 3, 2016). "Vaughan councillor challenges Yonge subway 'no-capacity mythology'". Toronto Star. Retrieved June 9, 2016. ^ Matt Elliott (December 5, 2014). "Sheppard subway is a costly cautionary tale Toronto risks repeating". Metro News. Retrieved December 5, 2014. ^ Royson James (March 2, 2016). "Subways we already have are doomed by built-in flaws: James". Toronto Star. Retrieved March 2, 2016. ^ Munro, Steve (March 2, 2015). "TTC 2015–2024 Capital Budget: System Expansion Projects". Retrieved June 29, 2016. ^ Munro, Steve (November 1, 2016). "SmartTrack Plans Unravel: Munro". The Torontoist. Retrieved November 3, 2016. The Spadina subway extension to Vaughan is expected to add $30 million (net) to the TTC's costs in coming years, but this number has only recently appeared in budget projections. ^ "Toronto-York Spadina Subway Extension Memo of Understanding – Operating and Maintenance Cost Responsibilities" (PDF). Toronto Transit Commission. June 18, 2008. Retrieved June 29, 2016. ^ "New Customer Service Agents at TTC stations". Toronto Transit Commission. December 17, 2017. Archived from the original on March 31, 2018. Retrieved December 7, 2017. As part of the ongoing modernization and implementation of PRESTO across the system, the TTC is introducing a new Customer Service Agent role. The collector booths you're familiar with on the TTC today will be closed over the course of the next year. ^ "Collector booths to close in favour of Customer Service Agents at TTC's Yorkdale and Lawrence West stations". ttc.ca. Toronto Transit Commission. Archived from the original on January 3, 2019. Retrieved January 3, 2019. ^ a b "New subway service is transforming Vaughan, but not all stations are busy, TTC figures show | CBC News". CBC. Retrieved November 11, 2018. ^ "Two stations on new York subway extension among the least used on the TTC network | The Star". thestar.com. Retrieved December 23, 2018. ^ "Spadina North extension preferred alignment". City.toronto.on.ca. February 12, 2012. Retrieved February 17, 2012. ^ "Eglinton West station to become 'Cedarvale' because of Crosstown LRT". November 24, 2015. Retrieved April 25, 2018. ^ "Yorkdale: Yorkdale Station Image Archive". Transit Toronto. Retrieved April 25, 2018. ^ "TTC Service Changes Effective Sunday, September 4, 2016". Reddit Toronto. Retrieved July 5, 2017. ^ a b c d Spurr, Ben (November 7, 2018). "TTC using 'gap trains' to improve service on busiest subway line". Toronto Star. Retrieved November 8, 2018. ^ Spurr, Ben (November 6, 2017). "TTC test of new signalling system 'exceeded expectations'". Toronto Star. Retrieved November 8, 2017. ^ "Modernizing the signal system: 2017 subway closures". Toronto Transit Commission. January 18, 2017. Retrieved January 23, 2017. [video position 1:56]Trains will be able to operate as frequently as every 1 minute and 55 seconds instead of the current limit of two and a half minutes. [2:19]When installation is completed along the entire line in 2019, it will allow for as much as 25% more capacity. [2:33]ATC will come online on all of Line 1 in phases by the end of 2019 starting with the portion of Line 1 between Spadina and Wilson stations and with the Line 1 extension into York Region that opens at the end of this year. ^ a b Spurr, Ben (May 9, 2017). "Mayor John Tory threatens to block subway extension unless province pays for relief line". Toronto Star. Retrieved May 9, 2017. ^ a b c d e TESS Kalinowsski, Real Estate Reporter (March 3, 2016). "York Region pitches Justin Trudeau on Yonge subway extension". Toronto Star. Retrieved June 3, 2016. ^ a b c Ben Spurr, Transportation Reporter (June 2, 2016). "Yonge subway extension to York Region takes step forward". Toronto Star. Retrieved June 3, 2016. ^ a b c d News release (June 2, 2016). "Yonge North Subway Extension Planning Moving Forward". Ontario Ministry of Transportation. Retrieved June 5, 2016. ^ Government of Ontario (2007). MoveOntario 2020 Projects Archived July 9, 2007, at the Wayback Machine Retrieved on October 14, 2007. ^ Leslie Woo; Anna Pace (June 25, 2015). "Yonge Relief Network Study" (PDF). Metrolinx. Retrieved June 9, 2016. ^ a b Tess Kalinowski, Transportation reporter (April 17, 2015). "GO to add almost 50 per cent more trains in next 5 years". Toronto Star. Retrieved March 30, 2016. ^ Steve Munro (July 5, 2016). "York Region Wants a Subway, Overstates Available Capacity". Retrieved July 11, 2016. ^ Spurr, Ben (January 31, 2019). "Relief Line must open before Yonge North subway extension, says Metrolinx". Toronto Star. Retrieved January 31, 2019. ^ "Richmond Hill Regional Centre Public Open House May 2009" (PDF). Richmond Hill Town Council. Town of Richmond Hill, Ontario. Archived from the original (PDF) on April 24, 2014. Retrieved April 23, 2014. ^ "York Region vivaNext Rapidways" (PDF). Metrolinx. Metrolinx. Archived from the original (PDF) on April 24, 2014. Retrieved April 23, 2014. ^ "Yonge Richmond Factsheet" (PDF). vivanext. Retrieved September 26, 2017. ^ "Editorials – Don't count on Yonge subway just yet". Newmarket Era. Yorkregion.com. August 15, 2007. Retrieved June 6, 2016. Wikimedia Commons has media related to Line 1 Yonge–University. "Yonge Subway Extension – Finch Station to Richmond Hill Centre, Transit Project Assessment Environmental Project Report" (PDF). January 30, 2009. Retrieved July 24, 2016. "Yonge Relief Network Study" (PDF). Metrolinx. June 25, 2015. Retrieved July 24, 2016. "Yonge Subway Extension – Environmental Assessment Submission and Project Update" (PDF). City of Toronto. December 16, 2008. Retrieved July 24, 2016.